Since publishing my Merry Christmas From SavingsPinay post I’ve been creating a whole lot of year-end posts. I did the My Extra Income Year-End Post on Saturday and my Personal and Financial Goals for 2016 yesterday. I still have four more posts left before I can SavingsPinay can finally bid goodbye to 2015. Anyhow, today’s post I would want to come clean to you. I’ve always been thankful to the people who make this blog alive, to the sweet SavingsPinay readers who wait for a new article to be published in this post. However, I believe I’ve been sort of a terrible blogger this 2015. I missed posting content for days even a week. I was inconsistent. You surprised me with your support over my SavingsPinay Series last October, November and December so for 2016 I’ll be doing more monthly SavingsPinay Series. I already have January planned out and it will be Financial Planning 101. SavingsPinay Series will be published every 3rd week of the month. 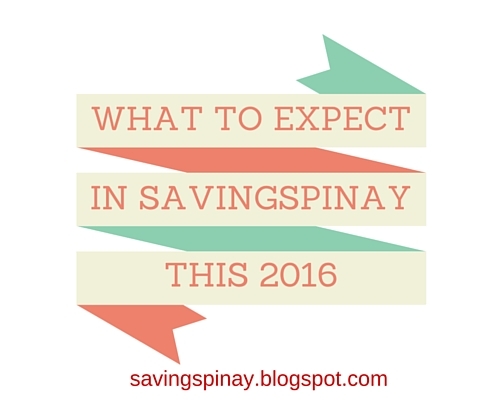 SavingsPinay Series | Intentional Living This 2016 Day 1 – New! SavingsPinay Series | Intentional Living this 2016 Day 2 – New! SavingsPinay Series | Intentional Living this 2016 Day 3 – New! Personal Posts – I’ll be sharing personal stories about how I do things like budget, saving money and others. This will also be the topic when I give updates about my life, my personal and financial goals etc. 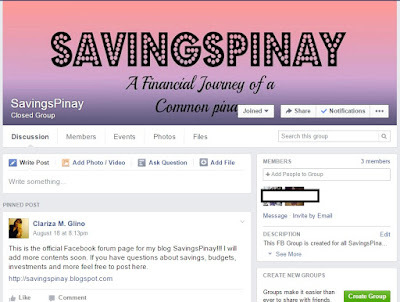 5 Pinay Personal Finance Blogs You Should Start Reading – New! I’m Just 21 Do I Seriously Need a Life Plan? Merry Christmas from SavingsPinay – New! My #iBlog11 2-Day Blogging Summit Experience – New! My Extra Income Year-End Report – New! Personal & Financial Goals for 2016 – New! Financial Lesson – Will involve a lot of how to posts, financial terms you need to know and more. How to Budget Your Money For The Coming Holidays – New! Productivity – Because I firmly believe that time management goes hand-in-hand in becoming financially successful I will also be blogging about time management. Budget – Anything that involves budgeting will go in here. Savings – Another fundamental topic that I’ll be blogging more. Career – I didn’t put any post in this topic but for 2016 this will be much more active. Posts will include career planning, creating resume and other job-related posts. Investment – Posts on how to invest, where to invest and more. For 20-something – As someone in her 20’s I wanted to reach out more on readers in the same age group. This doesn’t mean SavingsPinay will be limited. I will just have posts dedicated for those in their 20’s and wants to take advantage of their age towards financial freedom. First Impression – Every once in awhile I will try to review and/or create a first impression on a financial vehicle/financial product. All About – This is the opposite of the SavingsPinay Series instead of getting deep into a financial topic by dividing the content for a series of posts, All About will be one time – everything is in it post. It’s like an ultimate guide. This is something I am looking forward to fulfill in 2016. If you’ve already joined the program and entered your Email Address in the invitation on the top left corner of this blog or through the pop-up enter your email thing then THANK YOU. Expect the benefits every first day of the month. If you want to learn more about this then click this LINK. I planned to make YouTube videos out of my SavingsPinay blog posts and articles through my YouTube Channel. Sadly I only published two videos. 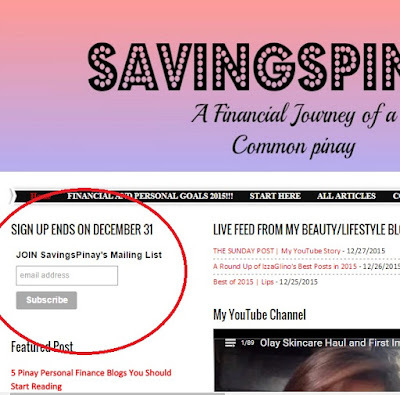 Now I decided to separate SavingsPinay with my personal beauty and lifestyle blog, IzzaGlino. And so, I created a YouTube Channel solely for SavingsPinay Web Lectures. Expect a lot of the published posts in this blog to have a corresponding video content in the end and/or before posts. I will make a blog post once its ready to launch. 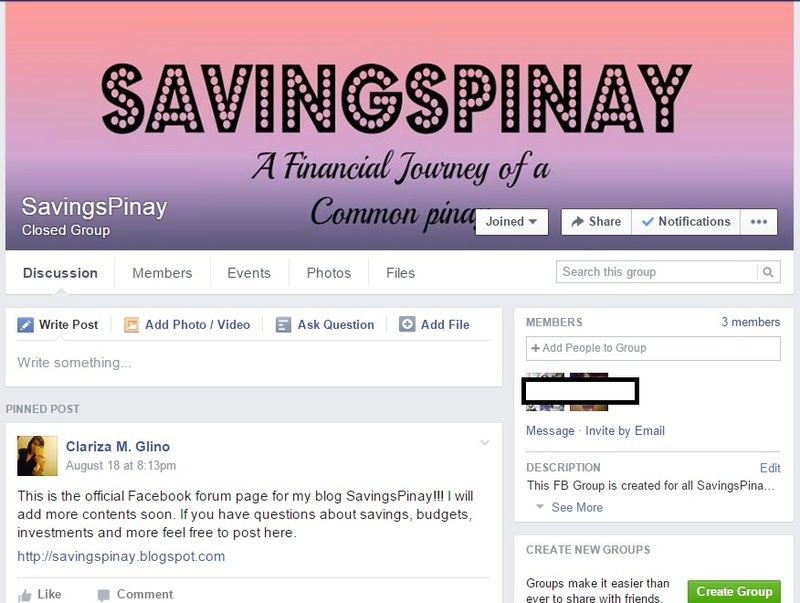 I want SavingsPinay to be a free source of personal finance lessons and inspirations for common Juans and Juanas. I pray that 2016 would be a great year for everyone.